The Torah lays the foundation for Judaism, Christianity, and Islam, whose followers amount to nearly half of the world's population, making this one of the most influential documents ever written. It's also one of the most enigmatic. There are passages that contradict each other, and chronologies that are difficult to reconcile with secular records. As a consequence, some scholars have concluded that it's pure fiction.1:78,2:78,3,4:2-3 But novelists are pretty good about writing stories that don't contradict themselves, for the sake of credibility. Successive generations are also pretty good about reworking fiction, there being no reason to remain true to something that was fabricated in the first place. Such stories accumulate the artistry of poets & minstrels, eventually sporting all manner of literary device, including rhyme, cadence, and sometimes even musical accompaniment. Examples of this can be found in every culture, from the Sumerian Epic of Gilgamesh, to the Greek Iliad & Odyssey, to the English legends of Beowulf & Sir Gawain. The Torah just doesn't fit that pattern. Clearly, the Jewish scribes were not given such poetic license, and were rather expected to leave the stories closer to the originals. Without the entertainment value, the massive effort was motivated entirely by the conviction that they were preserving real testimony, which of course isn't always poetic, and which sometimes contradicts itself, but which nevertheless has to be transcribed as given. If we are to think like detectives, we shouldn't conclude that conflicting reports constitute reason to believe that the whole thing was made up — rather, a good detective suspects fabrication when all of the reports are too consistent. So the historicity of the Torah remains an open question, inconsistencies and all. If we are to discern what actually happened (if anything), we have to study the reports carefully, and we have to compare them to independently obtained information, especially the archaeological evidence. By scrutinizing the content and style of each verse, scholars in the 1800s ce (starting with Julius Wellhausen) identified four different bodies of literature that got woven together into the Torah that we inherit.5 Clearly there was a common heritage, but in different regions, and during different periods, differences appeared in the way the stories were told. (See Table 1.) The oldest identifiable literary source was popular in the southern province of Judah, and is called Jahwist, because it uses YHWH as the name of God (and since Wellhausen was German, he used "J" for the "Y" in Yahweh). The grammar & vocabulary have been dated to ~950 bce , early in the First Temple Period. In the northern province of Israel, a slightly different version was in circulation, called Elohist because it uses Elohim as God's name. The language from that source has been dated to ~850 bce . The fusion of these two sources began in ~750 bce , when the priests in Israel migrated to Judah to get away from the advancing Assyrians. More material was added, along with more redaction, during the reign of King Josiah ( 640~609 bce ), in what is called the Deuteronomic Reform. The Priestly source materialized when the Jewish elite were in captivity in 597~539 bce , courtesy of King Nebuchadnezzar II of Babylon. After liberating them, Cyrus II of Persia called on the Jewish priests to set up a theocracy in Judah. This is when the Torah solidified into its present form (along with the subsequent books of the Tanakh, through 2 Kings). There are ongoing debates concerning which specific passages can be attributed to which sources, and in which periods, so we can look to future scholarship for further clarifications of the circumstances in which the Torah took shape.6 But there is little doubt that Wellhausen was fundamentally correct in his assessment that the Torah contains linguistic and ideological differences, which can be traced to different regions and periods of time. Why didn't the people doing each subsequent revision smooth out the inconsistencies, such that the whole thing would read like it was written by one hand? The most plausible answer is that they didn't want to disenfranchise any of the stakeholders. If the redactors had totally reworked the Torah, they would have put a lot of effort into it, and then they would have lost the support of everybody. But preserving as much of the original material as possible, even if it left contradictions, meant that all of the stakeholders could still point to pieces that were distinctly theirs, and thus have a reason to buy into the redaction. Put another way, ancient consensus building probably worked pretty much the same as it does today, and people actually don't have such a huge problem coming to an agreement on a framework that contains dichotomies, as long as they got a few of their pieces into it — then they will say that at least the consensus has some good in it, and it's unfortunate that stupid people had their say, but time will bear out the good parts, and that will validate the smart people — and this is what everybody is thinking. So the redactors had to do as little editing as possible, in the interest of not alienating anyone familiar with the original sources. Recent scholarship has tended to assign later dates to the original sources and/or the redactors who produced the final version, if any aspect of it could not have come earlier. This is a bit specious — a thing cannot be properly dated just by the newest aspect of it, nor the oldest for that matter. Unless there is strong reason to believe that modifications absolutely were not allowed, the old aspects are old, and the newer aspects are evidence of revisions. 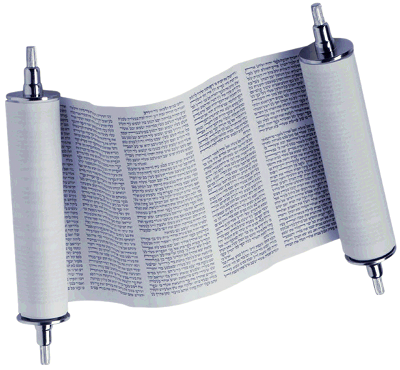 Some have even gone so far as to say that if any aspect of the Torah was written at a later date, the entire thing was spun, whole-cloth, at that later date. This is quite absurd — nobody would bother writing such a thing, because nobody else would bother reading it. Inconsistencies in the fusion of ancient and venerable traditions do not preclude a consensus, but without any existing authenticity, a new work full of contradictions is simply flawed. So the inconsistencies are actually evidence that the underlying traditions had to have been much older, and much more deeply rooted than the redactions. Thus the Torah cannot be fully understood as just literature mainly from the First Temple Period, with the last redaction coming early in the Second Temple Period, as dated by the literary analysis (such as in Table 1). That only tells us about the final rounds of editing. And we're still left with a patchwork of literature. Resolving the discrepancies will require that we look back to the original events that inspired the story in the first place, which were considerably earlier. 1560 Ahmose I exiled the Hyksos to Jerusalem. 1365 "Habirus led by Yashua" sacked Jericho. 1329 Tutankhamun abandoned Amarna, exiling its priests. 1312 Horemheb banished all remaining Atenists from Egypt. 1285 "Habirus of the Sun" moved from Moab into Canaan. 1208 Merneptah abandoned Pi-Ramses, exiling its people. Figure 1. 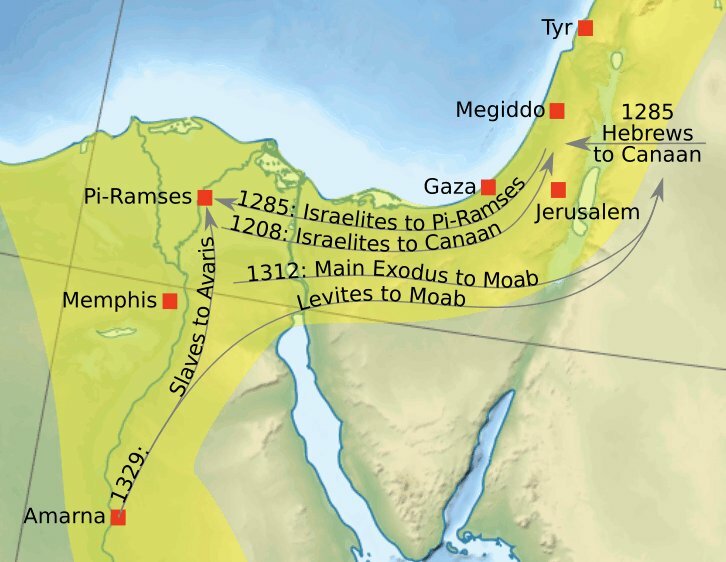 Hypothesized migrations between Egypt and Canaan, 1329~1208 bce . For each of these periods, there is a group of scholars contending that it is the likeliest historical context for the Exodus. Of course, they have to cherry-pick specific passages that point to that period, and neglect the passages that point to others. The broader truth is that they are probably all correct, except for the exclusivity — all of these migrations necessarily influenced the emerging culture. It's then possible that the chronologies in the Torah cannot be fully reconciled with secular records because several different stories have been compressed into one. To sort it all out, we have to identify which piece came from which period. So the 6 migrations that could have contributed material to the Torah occurred in the range of 1560~1208 bce . The oldest literature in the Torah has been dated to ~950 bce , though three other primary literary sources surfaced in the next 400 years. The editing seems to have been completed by ~450 bce . To this we can add archaeological findings, including contemporary literature from extra-bilblical sources, to see if a clearer picture of the original events emerges. As an aside, this document adheres to the emerging standard of using a tilde for all date ranges. Thus " ~1285 bce " means "roughly 1285 bce ", while " 1282~1208 bce " means "from 1282 to 1208 bce ." This clearly identifies it as a range and not a subtraction, or some sort of year-month-day combination, making it machine-readable, and laying the foundation for the computerized correlation of literature focused on similar periods in time. It also facilitates the pop-up text that appears when hovering the mouse over a date, showing the Anno Mundi equivalent(s).